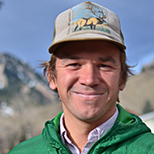 Philip Taylor is a postdoctoral fellow at the University of Colorado Boulder. His research focuses on how humans are changing the Earth and what these changes mean for human and ecosystem welfare, particularly in the tropics. He is passionate about developing strategies for a sustainable future and putting them into action in the public and private sectors.